Thanks to one of their previous employees who recommended Little Darling Diner, it wasn’t long before I decided I needed to pay this little piece of France a visit. Things happen at a slower pace here. I’m not referring to the service as that was superb the entire time but you can’t help but sit back and take your time at LDD. Thanks to the surprisingly large premises comprising of a two floor dining area as well as courtyard, you won’t feel pressure to gulp and go! Coffee by Volere Espresso and it was delightful. Full of flavour and very well priced at $3.30. I was intrigued by the honey, lemon and ginger winter warmer ($4) but thankfully winter is on its way out so I’ll try that another time. While LDD are licensed and their beer, sparkling, champagne and cocktail list is quite large, 9AM is a tad early to start on the alchohol! 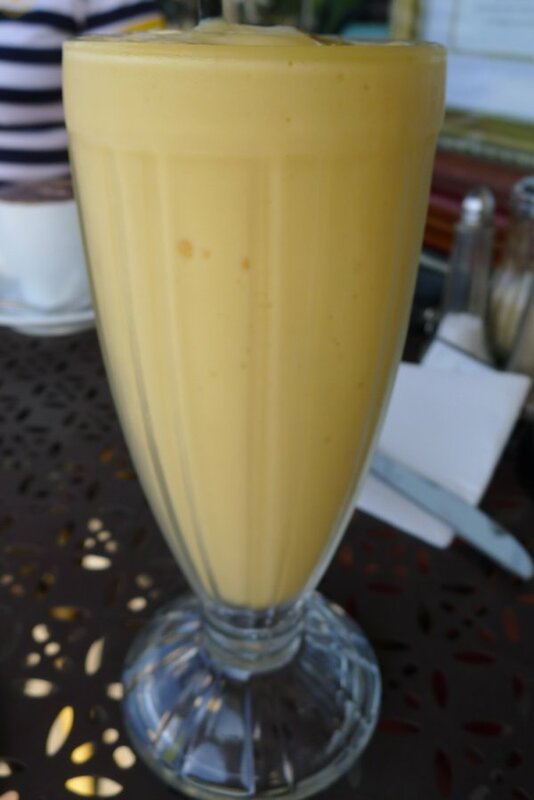 Three varieties of smoothie ($6.50) are available – banana, mango or mixed berry. Blended and mixed perfectly, the only downside was a slight tang to my smoothie (too early in the mango season?). Milkshakes ($5) are also available in chocolate, vanilla strawberry or caramel. 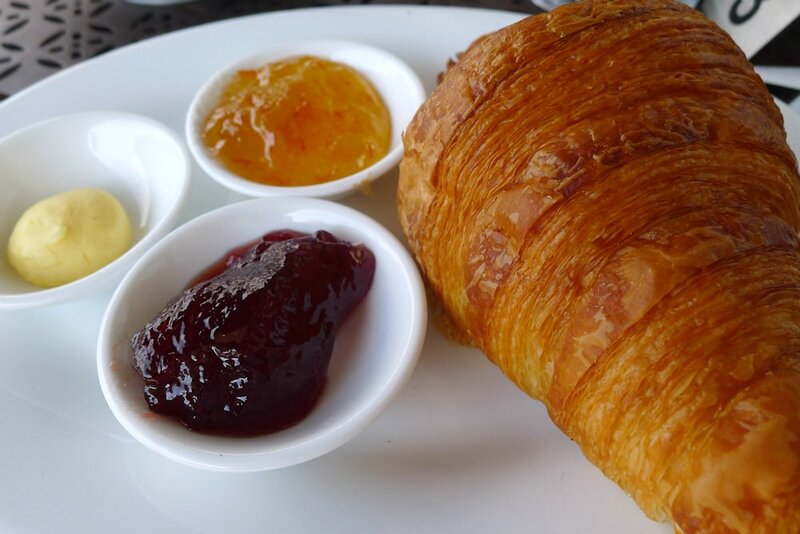 … a croissant with assorted jams ($6.50). 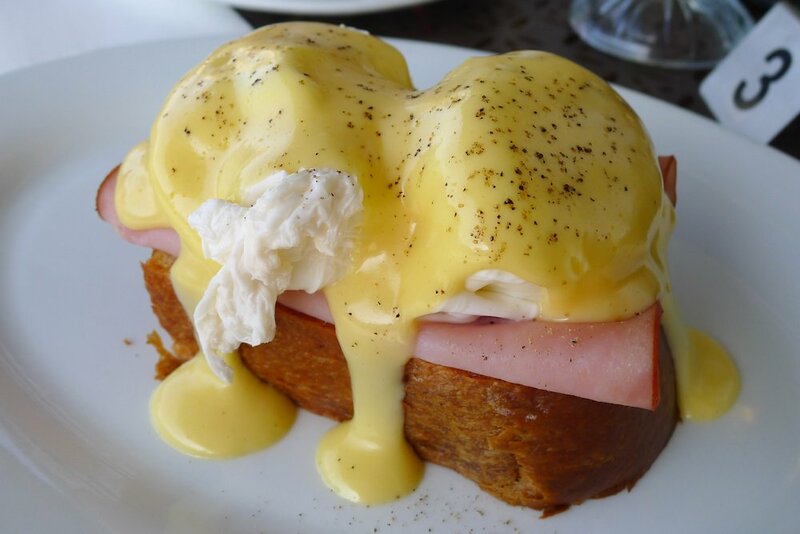 A superb example of the French staple, it was airy and buttery with a crunchy exterior. My guest was in the mood for something simple. 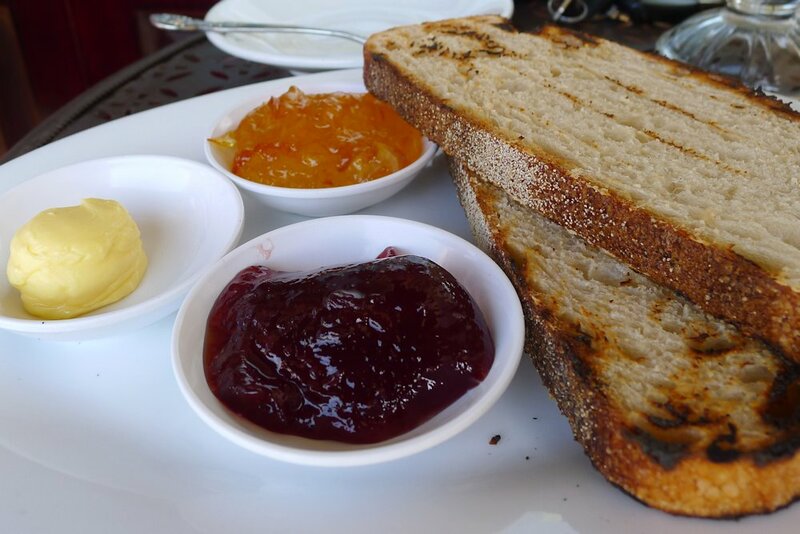 She chose the sourdough and even though she would have preferred a chunkier marmalade, she loved the toast and jam. 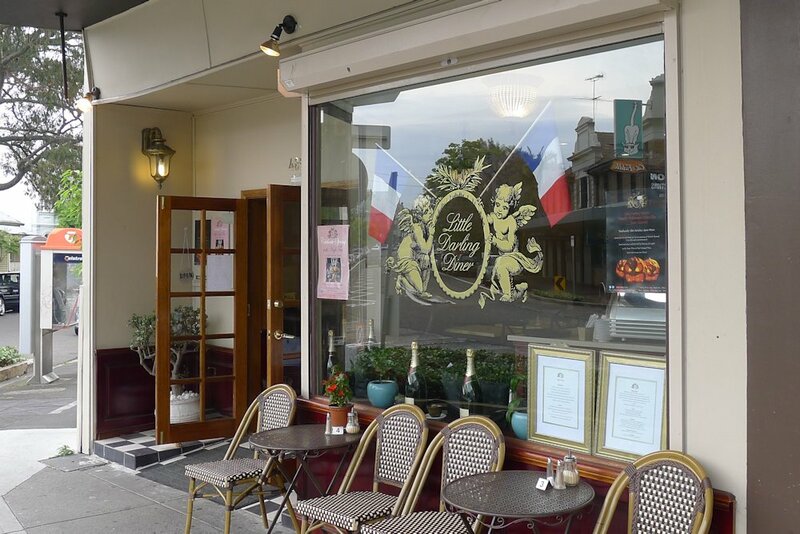 While we thoroughly enjoyed everything that we sampled, there was more I wanted to try – savoury crepe with ham, gruyere, sour cream and chives ($15.50), French toast brioche with Nutella, cumquats and almonds ($14.50) and scrambled eggs with truffle mushrooms and thyme ($14.50). The only dish I would have liked to see on the menu that was missing, is a fruit salad. With live music during weekend evenings and an inspired dinner menu, Little Darling Diner is one place I am excited to return to. 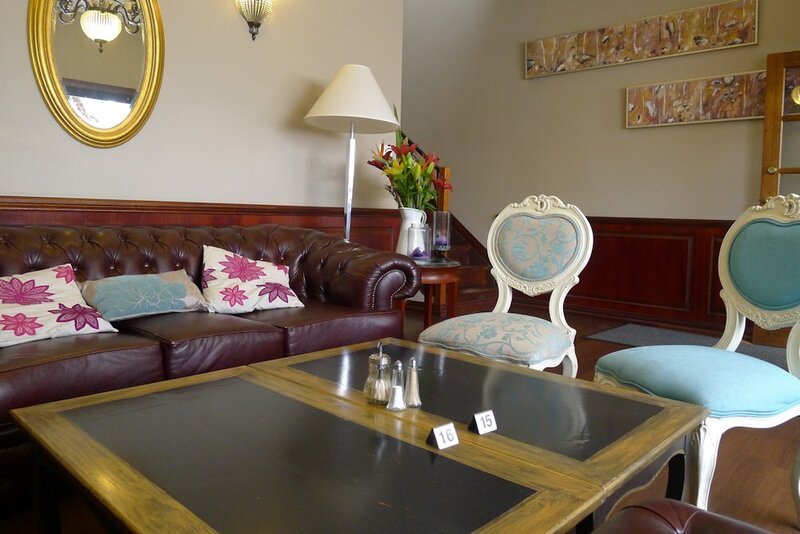 They are currently offering high tea for a limited time so call and make your booking! 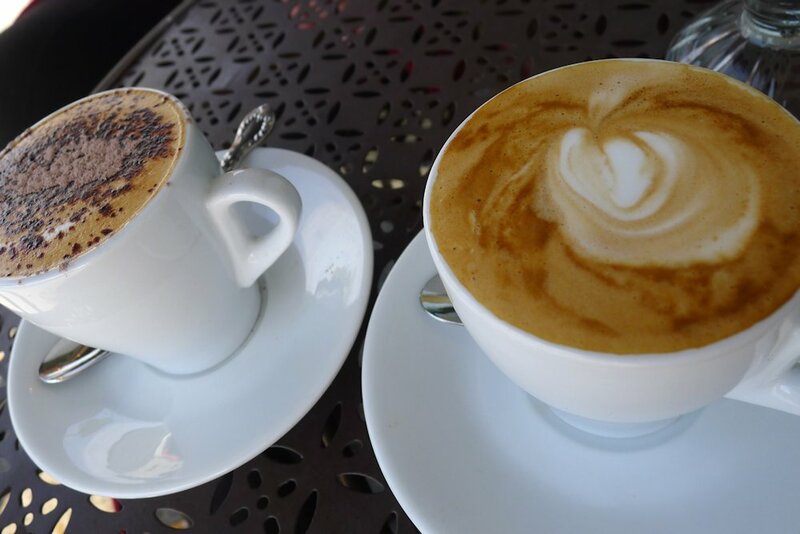 This entry was posted in Sydney - Inner East and tagged Disabled access, Dog friendly, Gluten free options, Outdoor seating, Parking close by, Reasonable prices. Bookmark the permalink.